Every day I have my child to raise over again. I will build self-esteem first, and the house later. I will finger-paint more, and point the finger less. I will do less correcting and more connecting. I will take my eyes off my watch, and watch with my eyes. I will care to know less and know to care more. I will take more hikes and fly more kites. I will stop playing serious, and seriously play. I will run through more fields and gaze at more stars. I will do more hugging and less tugging. I will be firm less often and affirm much more. “Some parents believe there shouldn’t ever be conflicts with their children,” says Thomas W. Phelan, Ph.D., author of the 1-2-3 Magic series of discipline books. However, the reality is that kids need the structure that setting limits provides—and some, like mine, aren’t getting it at home. Discipline helps them learn self-control and appropriate behavior. In fact, researchers have shown that children of lenient parents are more likely to act aggressively at school and are at greater risk for underage drinking. 2. I will calm down and relax. 4. I will allow them to make mistakes. 5. I will pray with them and for them. 6. I will appreciate their uniqueness. 7. I will remember that childhood years are fleeting years and enjoy and savor every single moment. Thank you for the wonderful food. Thank you for everything you provide for us. Thank you for everything we have. 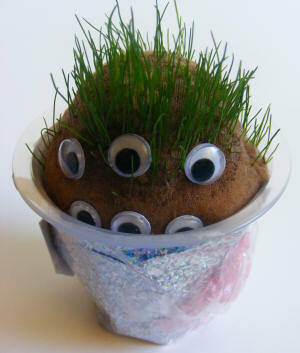 This is a brilliant nature craft for kids, who will love creating their own grass head monster and watching him sprout hair! You will need: A nylon sock or a foot from tights or a stocking. Paper, buttons, ribbon etc to decorate Instructions: Fill the toe of your sock with grass seed. Top up with sawdust until you have a ball shape. Fasten tightly with the elastic band. Decorate the yogurt pot as the body using, paper, ribbon, and whatever else you can find in your craft box! Stand the stocking ball in the pot with the grass seed at the top. Add some eyes and any other decorative bits you like. Keep the yogurt pot topped up with water. After a few weeks your head should grow hair! Make some of these gorgeous sweet treats with the kids this spring – perfect for cheering up the table or as an Easter treat, too! Put 300g of icing sugar in a bowl. Add 2 drops of peppermint essence. Now add condensed milk a tablespoon at a time (it should take about 4-5) mixing until you get a smooth dough. Take about 1/3 of the dough and knead in a drop of food colouring, adding more icing sugar if needed. 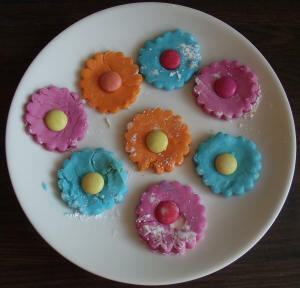 Roll out the fondant until it is about 5mm thick and cut out some flower shapes. Press a sugar-coated sweet into the centre of each flower. Leave in a cool, dry place overnight to harden (not the fridge). So pretty, and delicious too! Nurture your little one’s creativity with creative art projects. For free inspiration and detailed how-to instructions, check out the internet search engines for kids crafts and kid-oriented activities: You’ll find classroom activities, seasonal crafts and a mix of art, baking, and science fun for kids. Messy Play or Sensory Play? You might have seen the terms ‘messy play’ or ‘sensory play’ when you search online. Both can be used interchangeably and mean the same thing. So what exactly is messy play and sensory play? In short, it is an activity that engages a child’s senses including eyes, ears, nose, mouth, touch, balance, or movement. According to Piaget’s theory of development, children from the age of zero to eight are in two different stages of development: the sensorimotor stage from ages zero to two and the preoperational state from age two to around seven or eight. In both of these stages, play through experimenting and exploring their environment is critical for development. The sensorimotor stage from birth to two is all about using the senses to explore this brand new world. How things feel, taste, sound, look like, and how your baby moves in order to explore these things aids in their cognitive learning. They quickly learn how much strength they need to pick up a block or if something feels soft or hard. We all have a small window of time where we can build good education at home. It begins in infancy. Brain studies show that children’s ability to learn depends largely on their experiences in the first years of life. In short, the more you talk and read to your children, the better they can learn. Read to your children every day. . .
Talk with your children. . . Respond to your children. . .
Demand proper behavior. . .
A key difference that separates effective fathers from all other fathers is that they really know their children. Getting your 3-year-old to behave can be a challenge. The trick is consistency and learning to pick your battles.